This was one of the funniest Nia vs Liv challenges that we have done so far. Basically, we had a big bag of elastic bands and a timer. 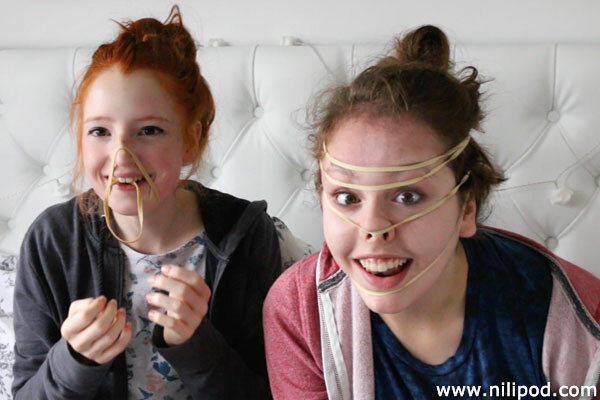 The challenge was for us to try and put the most elastic bands on our faces, although they were quite small, so it was actually far more difficult than we initially expected. We made a funny video of this challenge and it is really worth watching, because we fall about laughing and as you can see by this photo, Liv was brilliant at this game and made herself turn into a laggy band monster. Nia, on the other hand, struggled just a little bit, but enjoyed playing nevertheless. Who do you think won the challenge? Watch the video to find out, although you can probably guess by simply looking at the photo, probably! One of us certainly found it quite a lot easier than the other.